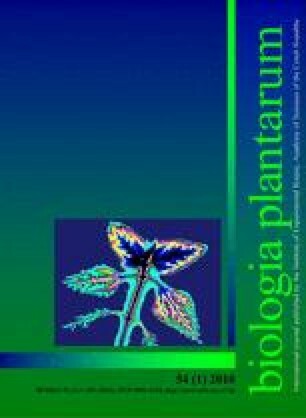 Sap flow and potential evapotranspiration rates were analyzed for two coniferous tree species (Douglas-fir and Scots pine) and one broadleaf species (sessile oak) in a mixed Carpineto-Quercetum forest during the growing season 2005. The relationship between sap flow and potential evapotranspiration rates, effective crown area as a measure of the relative transpiration and daily relative proportion of the storage water used for transpiration were used as indicators of the tree water dynamics. These indicators were determined on four consecutive days and all three showed good reliability concerning tree water dynamics. The authors thank V. Nadezhdin for technical assistance. Funding was provided by the Bilateral Exchange Programme of the Flemish Community and the Czech Republic (Contract No. BWS-BOF-2004), by the Project of the Ministry of Education, Youth and Sports of the Czech Republic (MSM 6215648902) and by Project NAZV QG 60063 on “Douglas-fir the most important introduced species in sustainable forestry”.